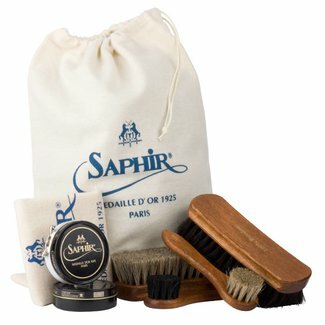 Saphir Médaille d'Or shoe brush white is made in France fro..
Saphir Médaille d'Or shoe brush black is made in France fro..
Saphir Médaille d'Or shoe care set in bag contains several ..
Saphir Médaille d'Or shoe care box which contains several s..
Saphir Médaille d'Or shoe care set which contains several s..
Saphir Médaille d'Or shoe care case which contains several ..
Saphir Médaille d'Or shoe brush set is made by hand in Fran..
Shoe care products are given the luxury touch with the range from Saphir Médaille d’or, allowing you to keep your footwear in the very best condition. Made in France, Saphir Médaille d’or shoe care products are of the very highest quality, with the finest ingredients made to a traditional recipe. Protect your footwear and give it a truly luxurious finishing touch with one of the Saphir Médaille d’or products which are loved by footwear manufacturers and customers alike. With more than a century of tradition now behind the brand, Saphir was honoured in 1925 during the Paris World Exposition. 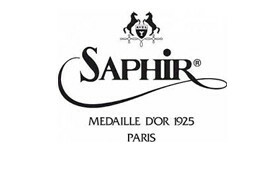 Presented with the gold medal - the “Médaille d’or” - Saphir was acclaimed as one of the leading shoe care manufacturers in the world. The products developed by Saphir are of such a high standard that they’re the leading choice for many shoe manufacturers; particularly the shoe creams and waxes, even to this day. 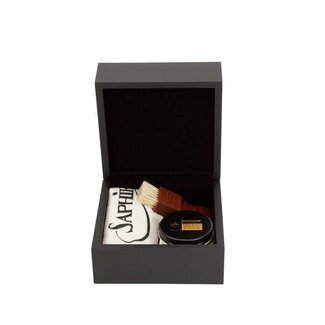 Saphir have gone on to develop another leading line of shoe care items, Saphir Beauté du Cuir, of which a select number of products can be found right here at Quality Shop. With the same commitment to quality ingredients, this new range focuses on cutting edge technologies. One of the reasons that the Saphir Médaille d’or range has proven to be quite so popular is the insistence on only the very best quality items being used. This means only natural and pure ingredients such as beeswax, minerals and turpentine. However the exact recipe for their popular products is a closely guarded secret with Saphir keeping their lips tightly sealed for decades! 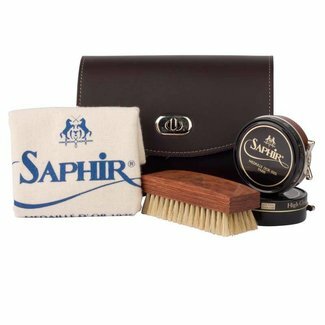 As well as the shoe care line of products, Saphir also has an addition range of accessories including brushes. 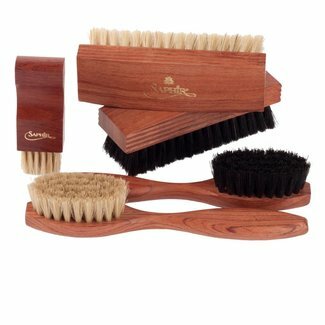 The same commitment to quality can also be found here, with premium horse hair used for the brushes along with a type of West African exotic wood, bubinga. This wood is entirely sustainable so there’s no need to compromise your eco-principles to treat yourself to the very best. There’s a diverse range of Saphir Médaille d’or products to be found here at Quality Shop so whether you want a soft polishing cloth, a suede cleaner, or a high quality brush, you’ll find there’s plenty of choice. 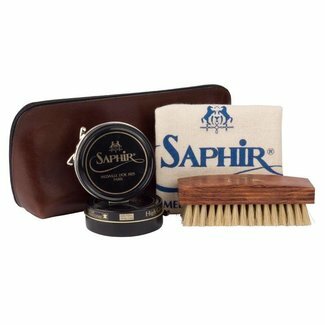 If you don’t own a shoe care kit, Saphir Médaille d’or have a starter set which contains all the basics you’ll need to begin. Included in the pack is a pair of cedar shoe trees, 1 classic neutral applicator brush, 1 Saphir Médaille d’or Pate de Luxe, 1 Saphir Médaille d’or Pommadier and 1 Saphir Médaille d’or Lotion. You can of course purchase all the components separately if you already have some shoe care treatments and simply want to top up your stash. If you’ve never used Saphir Médaille d’or products before you’ll find whatever you’ve had before simply pales into insignificant. The quality of Saphir Médaille d’or is clear for all to see and your shoes will gleam and sparkle like never before. And what’s more, not only will they look good, they’ll also be protected too so they will last longer. That’s what we call value for money! 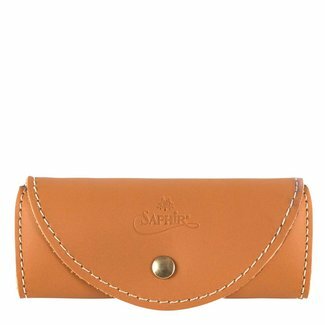 Whether you prefer leather or suede, there’s a range of Saphir Médaille d’or products designed to take care of your shoes in the very best possible way.